Knights will face Memphis at 3:30 p.m. Saturday in Spectrum Stadium. The No. 8 UCF football team will host the American Athletic Conference Championship for the second consecutive year Saturday. As East Division champion, the Knights will take on West Division champion Memphis in Spectrum Stadium at 3:30 p.m. on ABC. The Knights, who are coming off a 38-10 win in the War On I-4 rivalry series against USF on Black Friday, are chasing their fourth American trophy since joining the conference in 2013. If UCF’s recent matchups against Memphis are any indication of what’s in store for Saturday, there’s bound to be some fireworks. The two teams squared off in last year’s title game at Spectrum Stadium, and the Knights pulled out an exhilarating 62-55 double overtime win that clinched their spot in the Chick-fil-A Peach Bowl. UCF and Memphis also met in October this year in Tennessee, where the Knights rallied in the second half for a down-to-the-wire 31-30 win. Fans took it upon themselves to promote wearing leis to Saturday’s title game as a symbol of their support for Hawaiian native and UCF quarterback McKenzie Milton, who underwent successful surgery after his leg was badly injured during Friday’s game in Tampa. 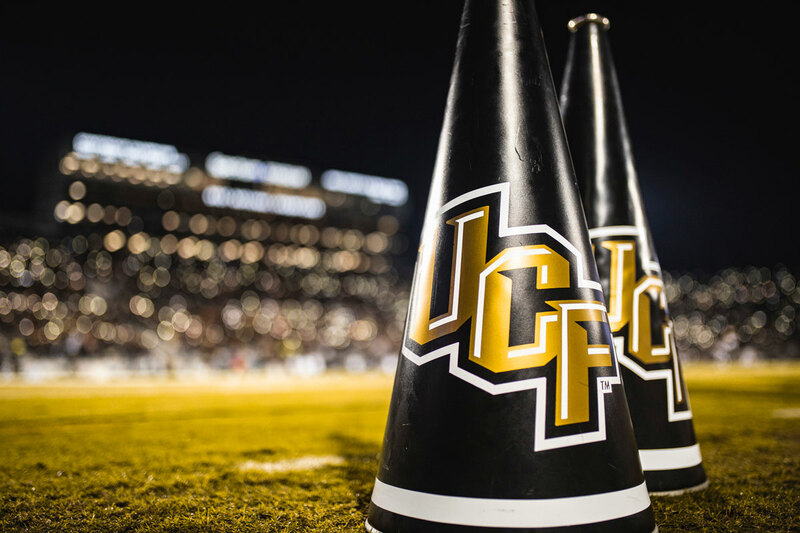 On Tuesday morning, UCF Athletics announced that thanks to a combined effort with Global Promo and the UCF Student Government Association, the Knights will be joining the movement by distributing 40,000 leis at the stadium prior to kickoff. Fans are encouraged to wear black to the game. In the Milton family’s first update to fans on Nov. 24, they closed their statement with the message: “Remember what Ohana means. No one gets left behind. #UCFamily.” Since then, the hashtag #10hana has grown in popularity as a sign of support as it combines Milton’s jersey number and the Hawaiian term. Milton’s parents shared an update on his progress Tuesday afternoon, revealing that blood flow has been restored to his leg, a nerve is injured and he will have reconstructive surgery to repair his knee on a date yet to be determined. They thanked Knight Nation for their well wishes. On Wednesday, the American Athletic Conference announced Milton as its pick for the Offensive Player of the Year. He was also the AAC Offensive Player of the Year in 2017, marking the first time a football student-athlete has ever won that award in consecutive seasons. Due to the volume of fans calling the UCF Athletics Ticket Office to purchase their 2019 season tickets, American Athletic Conference Championship game tickets will be available exclusively online through ucfknights.co/18singlegame . To purchase season tickets for 2019, call 407-823-1000. UCF students can claim their tickets until the day of the game through ucfstudenttix.com. Note: claiming a ticket does not guarantee entry. Early arrival to the stadium is strongly encouraged as seating is first come, first served. Students MUST have a UCF student ID and mobile ticket upon arriving at the gate. For an FAQ about student tickets, visit ucfknights.com. Student guest tickets are officially sold out for this game. The E parking lots around Spectrum Stadium and Garage F will open at 8 a.m. for fans with game day permits for those areas. All other campus parking lots, garages and Memory Mall will open at 9:30 a.m., when tailgating begins. The UCF Alumni Indoor Tailgate, which is free for all alumni and their guests, will start at 12:30 p.m. at the UCF FAIRWINDS Alumni Center. Please remember a clear-bag policy is in effect at Spectrum Stadium and it’s important to know your gate of entry. Express lanes are available for fans who don’t have any bags. These can be found in all lanes for gates 5 and 9 and some lanes in gates 12, 13 and 18. While fans are encouraged to not bring any bags, those that do can review the policy. For additional information on game-day policies and procedures, including parking and shuttle information, please visit UCFGameDay.com. UCF will be playing in the postseason for the 10th time in program history. The College Football Playoff selection committee will reveal its final rankings on Sunday, Dec. 2, determining playoff matchups and the New Year’s Six participants. ESPN will air coverage of selection day starting at noon. Follow UCF’s official social media accounts — especially Twitter: @UCF_Football; @UCFKnights; @UCF — for real-time updates and information regarding the Knights’ bowl berth.